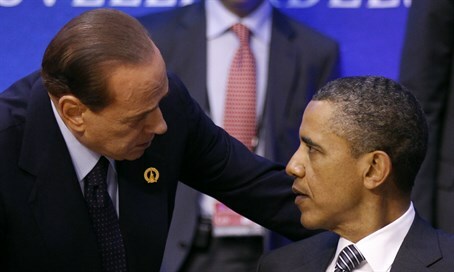 Italy summons American ambassador to Rome after WikiLeaks reveals the NSA spied on ex-premier Silvio Berlusconi. Italy's Foreign Ministry said Tuesday it had summoned the American ambassador to Rome over reports of widespread American surveillance of ex-premier Silvio Berlusconi, among several other European leaders, AFP reports. U.S. ambassador John Phillips was called in "for clarification on the media reports that allege Italian leader Silvio Berlusconi and some of his close associates were subjected to wiretapping in 2011," it said in a brief statement quoted by the news agency. Earlier on Tuesday, a Wikileaks report revealed that the National Security Agency (NSA) tapped into phone calls between Prime Minister Binyamin Netanyahu and European leaders, including Berlusconi. A newly released batch of NSA reports uncovered by the website revealed that Netanyahu appealed to Europe to intervene with President Barack Obama during their public 2010 spat over a Jerusalem building project. The NSA caught wind of Netanyahu’s efforts when it intercepted a phone call between the Israeli Prime Minister and Italian Prime Minister Silvio Berlusconi, in which Netanyahu asked the Italian leader to reason with Obama. But the American spying on Italy did not end there, according to Italy's La Repubblica and Germany's Sueddeutsche Zeitung, which cited other classified documents released by WikiLeaks and which reveal the NSA spied on leaders from German Chancellor Angela Merkel to UN Secretary General Ban Ki-moon. Among the WikiLeaks documents were details of a 2011 meeting Merkel held with Berlusconi and then French president Nicolas Sarkozy. The Wikileaks document is only the latest example of Obama’s clandestine surveillance operations monitoring the Israeli Prime Minister. Last December it was reported that the NSA had continued spying on Netanyahu despite a pledge by President Obama to halt wiretaps on friendly heads of state. Details of the NSA's spying program were first leaked three years ago by former NSA contractor Edward Snowden. Snowden’s leaks revealed, among other things, that the NSA had monitored the phone conversations of 35 world leaders. The documents particularly caused tensions with Germany, after Merkel phoned Obama and accused the NSA of monitoring her telephone conversations.